Cookbooks are two a penny (literally, if you frequent remainder book stores) all looking for that angle to appeal to a dwindling number of consumers who actually cook for themselves. 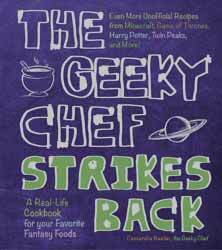 Personally I've not bought a cookbook since I discovered the Yummly app... but The Geeky Chef provides recipes that are perfect for every TV/Movie/Gaming geek. This is the perfect book for those that like to host themed parties or fancy trying something a little new based on their favourite sci-fi property (this cookbook covers books, movies, TV shows, and video games and Includes drinks (alcoholic and non-alcoholic), appetizers, snacks, and sides, soups and stews, main courses, cakes and cupcakes, and other desserts. The recipes themselves appear to be based on American measurements (It's an American book after all) with ingredients being measured in cups. But that's not a huge issue as you can easily pick up measuring cups online (or even find a conversion website). It's novel and easy to follow with photos to show you how things should turn out. There's even a nice range of cooking levels - but even the novice cook should be able to easily master the majority of the recipes.